Discount applies to base price only. 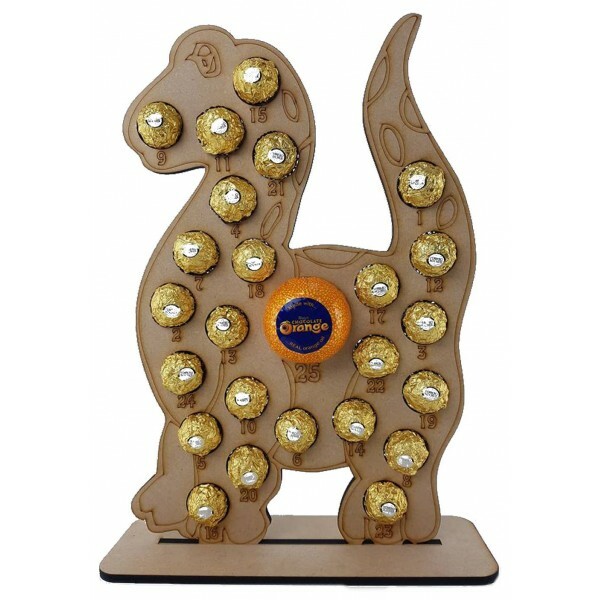 Large Shape with a cut out space to hold a 1 'Terry's Chocolate Orange' and 24 'Ferrero Rocher' or 'Lindt Chocolate Balls' to countdown the days until christmas. Etched numbers above each chocolate. The perfect gift for anyone and everyone at Christmas, especially if they love chocolate orange and ferrero rocher! All of our items are laser cut and etched in great detail for a more defined item. Great item for home crafting or professional crafting. Any Standard items with stands, size options,cut in 6mm or with plaques may take slightly longer as they are cut to order.